‘Competition’ is not a dirty word. 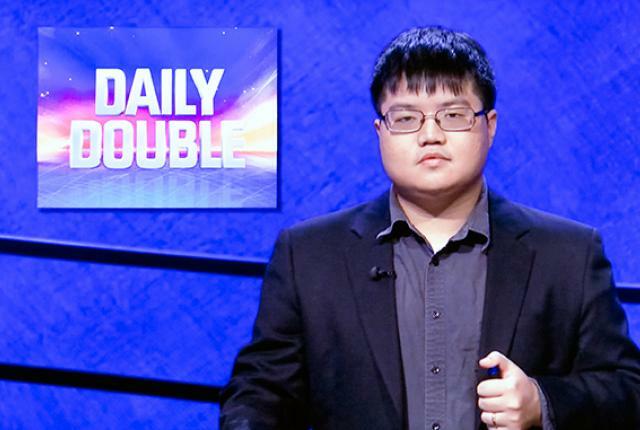 As Arthur Chu continues on his winning way on Jeopardy!, the haters – including none other than The Washington Post ! – continue to hate. I still don’t get it, and neither does April Sperry, writing for The Huffington Post today. In her article Arthur Chu Is A Good Thing For Jeopardy!, she makes a number of points explaining why Arthur’s not wrecking the game – he’s working it; using freely available information about the show to come up with a strategy, and then employing that strategy in playing the game. And it’s working for him! Maybe Chu is ushering in a whole new play style that will forever reinvent the game. Maybe it’ll die out when his run is over. It doesn’t matter; change happens. 2. He’s not ruining the Jeopardy! spirit; he’s embracing it. The point of Jeopardy! is to answer questions, make money and survive to compete another day. That’s exactly what Chu is doing. 3. He’s making people really think. Chu is keeping his competitors on their toes in a whole new way by bringing strategy into the mix. 4. His “advantage” is hardly unfair. He got his “game-wrecking” ideas from Google. Literally any contestant could have tried out his strategy — any contestant still can. They just aren’t, which is a personal choice. 5. It’s not just a game. When contestants have thousands of dollars on the line, it’s more than just a game. When winning a game show could drastically change your financial future, yeah, it’s okay to play for keeps. When I worked behind the scenes on a Deal Or No Deal, I never ceased to be amazed at the number of contestants who would say “Oh well, I came here with nothing…” They tended not to finish that sentence, but it sounded like if they did, it would end with the words “… so it’s alright if I go home with nothing”. If arriving with nothing and going home with nothing was alright, then the whole thing is just an exercise in futility – you may as well stay at home. You’ll get exactly the same result. When you’re a game show competitor, you should be competitive! You owe it to yourself. And for the audience, it also has the side effect of making the game much more interesting and involving to watch. Good luck to King Arthur – long may he reign. This entry was posted in 'Jeopardy', Strategy, Tactics, Updates by Stephen. Bookmark the permalink.